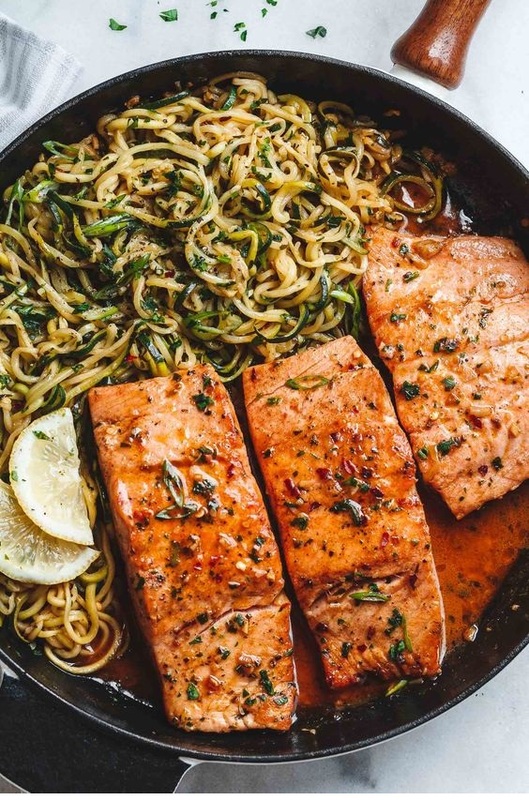 15-Minute Lemon Garlic Butter Salmon with Zucchini Noodles – Light, low carb and ready in 15 minutes. Thoroughly season salmon fillets on all sides with salt and pepper. Heat butter in a large cast iron skillet. Add the pieces of salmon to the skillet, skin side first, and cook for 2-4 minutes on each side – depending on thickness. For best results, use a fish turner to flip salmon. Remove from the skillet and set aside. In the same skillet, melt remaining 2 tablespoons butter. Add lemon juice, hot sauce, minced garlic, half the parsley, and red pepper flakes (if you want).